Late check out (after 9:00 AM and before 11:00 AM) may result in a fee. CANCELLATIONS: Allcancellations must be in writing. Funds paid to “CHOOSE TO BE HAPPY!”, are refundable, less 10% administrativefees, if reservations are cancelled with at least 30 days’ notice. Full refundwill be offered for reservations cancelled with less than 30 days’ notice onlyif we re-book the reservation. We will make every effort to re-rent your home.If we are able to re-rent the home for the same rate and time we will refundyour deposit. In the event “CHOOSE TO BE HAPPY!” is unable to re-rent thecancelled period, the total rental amount, including taxes and all applicablefees, will be due in accordance to the confirmation terms, with all advancerental payments forfeited. Check-in time is after 3:00 PM and check-out is before 11:00 AM. An early check-in or late check-out is available for a fee. Due to security reasons, software and or files may not be downloaded by guests on any in-home computer. NOTICE: All properties represented by “CHOOSE TO BE HAPPY!”, are individually owned and furnished to the needs of the owner. Owner's personal property must be respected. “CHOOSE TO BE HAPPY!” represents the owner(s) of the property(s) in a client/agency relationship. The terms Guest(s) & Tenant(s) are used interchangeably and are defined as the principal party(s) renting a vacation property & those accompanying the principal party. Please Review Terms and conditions of occupancy as these terms apply to all properties. Terms and Conditions are not subject to any modification. Additional charges if any, for High chair/Crib/rentals. 1. RESERVATION DEPOSIT: Reservations require an initial 30% reservation deposit that is applied toward the entire reservation. Upon receipt of initial reservation deposit, a confirmation with payment due dates will be mailed to the principal party named on the reservation. 3. SECURITY/DAMAGE DEPOSIT (REFUNDABLE): A minimum Security/Damage deposit of $200 USD is required. The Security/Damage deposit is to ensure compliance with the Terms of Occupancy. The Security/Damage deposit is held until determination of condition and content of the rental property upon check-out. Security/Damage deposits will be refunded within 7 business days after departure. Charges are assessed to cover damage. Please report any problems or damages observed in the rental property upon check-in. Unreported problems and /or damages are assumed to have occurred during occupancy and guest shall be held responsible for those damages. All reservations must be guaranteed by a valid credit card at time of booking. CHOOSE TO BE HAPPY reserves the right to either charge or pre-authorize the provided credit cards up to the full reservation amount at point of reservation. Non-valid credit cards will result in automatic cancellation of the reservation. CHOOSE TO BE HAPPY also reserves the right to collect, through pre-authorization, at least $200 USD per room as deposit for incidentals or damage. To adhere to proper card acceptance and validation norms defined by credit card associations, all hotels are required to pre-authorize - or separately, charge - all provided credit cards. A pre-authorization will place the pre-authorized amount in a holding-state and temporarily reduce one's credit card limit, but it is NOT a transaction charge and will not be reflected in one's credit card statement. Depending on one's credit card bank's set up, the pre-authorized amount will drop off typically after 14 days. 4. CANCELLATIONS: All cancellations must be in writing. Funds paid to “CHOOSE TO BE HAPPY!”, are refundable, less 10% administrative fees, if your reservation is cancelled or modified up to 14 days before date of arrival, no fee will be charged. If cancelled or modified after or in the case of “no-show”, 30% of the total cost of the reservation will be charged. Full refund will be offered for reservations cancelled with less than 14 days’ notice only if we re-book the reservation. We will make every effort to re-rent your home. If we are able to re-rent the home for the same rate and time we will refund your deposit. In the event “CHOOSE TO BE HAPPY!” is unable to re-rent the cancelled period, the total rental amount, including taxes and all applicable fees, will be due in accordance to the confirmation terms, with all advance rental payments forfeited. 5. PETS: MOST PROPERTY OWNERS DO NOT ALLOW OR ACCEPT PETS due to owner preference or allergy concerns. 6. METHOD OF PAYMENT: All rates quoted by “CHOOSE TO BE HAPPY!” are amounts payable by cash, money order, or credit card in U.S. funds. “CHOOSE TO BE HAPPY!” accepts ALL major credit cards including Master Card, Visa and American Express. All non-U.S. Bank Drafts are subject to collection and processing fees. To avoid excessive bank fees, we suggest obtaining drafts on U.S. banks. 7. CHECK-IN TIME (3:00 PM): Regular check-in starts 3:00 PM. Early Check-in attracts a fee of $35.00 USD. If you prefer to check in as early as 9:00 AM, we advise you to contact us as soon as possible and prior to your arrival. 8. CHECK-OUT TIME (11:00 AM): Regular check-out ends 11:00 AM. Late Check-out attracts a fee of $35.00 USD. If you prefer to check-out as late as 4:00 PM, we advise you to contact us as soon as possible. All property keys must be returned. There is a $35.00 charge to principal party for lost, missing or keys not returned to “CHOOSE TO BE HAPPY!” by 11:00 AM on day of departure. Fees for non-returned keys will be charged to the guests. 10. SUBLETTING PROHIBITED: Guest acknowledges that the rental property may not be sublet. Subleasing shall immediately void any rental agreement with no refund due to guest. 11. GUEST/OCCUPANCY: Vacation properties are limited to the maximum occupancy as stated in the confirmation provided with these terms of occupancy. Overnight guests (8:00 PM - 8:00 AM) are limited to the maximum occupancy limits and includes all adults and children. 12. HOUSE PARTIES/LARGE GATHERINGS: House parties and large gatherings exceeding maximum occupancy are prohibited and may result in guest's immediate removal. 13. QUIET HOURS: For guest's enjoyment and the enjoyment of others, please respect quiet times between 9PM and 8AM. 14. ACCOMMODATIONS: Accommodations range from luxury homes to basic functional apartments. All properties are privately owned, individually furnished and equipped for housekeeping with basic items such as pillows, blankets, cookware, flatware and dishes. Other small appliances, chairs, grills, TV, radio, fans, etc., may or may not be provided. “CHOOSE TO BE HAPPY!” is unable to provide additional furnishings or appliances. 15. MECHANICAL & APPLIANCE FAILURE: “CHOOSE TO BE HAPPY!” will use its best efforts to have mechanical (water, septic, electrical and plumbing) and appliance failures corrected as soon as possible, but cannot control the scheduling of outside service contractors. NO REFUNDS will be made for appliance(s) or mechanical failures or breakdowns. “CHOOSE TO BE HAPPY!” shall have the right to arrange, inspect and make repairs during rental period. Tenant will be charged for unnecessary maintenance and service calls or repairs caused by abuse beyond normal wear and tear. NO refunds will be made for the malfunction of appliances or other equipment. 16. CONSTRUCTION: We cannot predict when or where new construction will begin. “CHOOSE TO BE HAPPY!” has no control in these situations, and cannot move or offer refunds on confirmed reservations if construction occurs near the property being occupied for rental purposes. 17. PROPERTY RESERVED: Each rental property is privately owned and reflects the owner's personal taste. Each property is represented by “CHOOSE TO BE HAPPY!” as realistically as possible with regard to space, physical size and comparison. 18. COMMUNITY RULES/REGULATIONS: Some individual communities and associations have rules and regulations that become part of the guests Terms and conditions of Occupancy. Community rules that apply are provided to tenant at check-in or may be requested prior to occupancy. 19. UNFORESEEN CIRCUMSTANCES: If the rental property becomes unavailable or uninhabitable, “CHOOSE TO BE HAPPY!” reserves the right to move a guest to a comparable location accommodating the same number of persons and within the same price range. “CHOOSE TO BE HAPPY!” cannot guarantee availability or comparability of other properties. Owner and “CHOOSE TO BE HAPPY!” are not liable for any acts of nature or major mechanical failure that would prohibit or limit the use of a property. 20. ERRORS & OMISSIONS: “CHOOSE TO BE HAPPY!” has taken great effort to ensure the information in our brochure, website and all of our printed material are accurate. We cannot be held responsible for errors, omissions, or change in prices. All rental properties are privately owned and their furnishings vary depending upon the owners' taste. “CHOOSE TO BE HAPPY!” cannot guarantee the presence of particular listed furnishings because they may change from time to time depending on the owner's taste. 21. LIABILITY: Guest(s) hereby agree(s) to hold and save harmless “CHOOSE TO BE HAPPY!”, their employees, and the property owner from damages or injuries to personal property by reason of any cause whatsoever, either in or about the occupied property or elsewhere. 22. AGENCY DISCLOSURE: “CHOOSE TO BE HAPPY!” represents the property owner(s). 23. GUEST RESPONSIBILITY: The guest whose name appears on the confirmation is responsible for all terms and conditions set forth in this document for them, their guests or others they may have visiting or staying at the vacation rental property during their term of occupancy. 24. VIOLATION OF TERMS OR CONDITIONS OF OCCUPANCY: When Guest(s) violate(s) any of the terms of occupancy, property rules, community rules or regulations, the guest(s) may be asked to vacate the property by “CHOOSE TO BE HAPPY!” and NO refund will be due to guest(s). GUEST AGREES TO ABIDE BY THESE TERMS OF OCCUPANCY UPON TENDER OF ANY PAYMENT. “CHOOSE TO BE HAPPY!” AGREES TO MAKE PROPERTY AVAILABLE SUBJECT TO THIS DOCUMENT AND RENTAL CONFIRMATION SUPPLIED TO GUEST. Set in the epitome of rare natural beauty, where tranquillity meets pure rustic scenery, is our Long Mountain Cabin.Located above the Beverly Hills community,with the Blue Mountains as its backdrop, the view from this cabin is riveting & spectacular. The Space The Cabin is ideal for executives, guests, couples, etc. who are visiting Kingston for the first time or returning to our beautiful shores to do business or simply relax. “Choose To Be Happy!" @ Long Mountain Cabin (LMC) is a fully self contained 900 Sq. 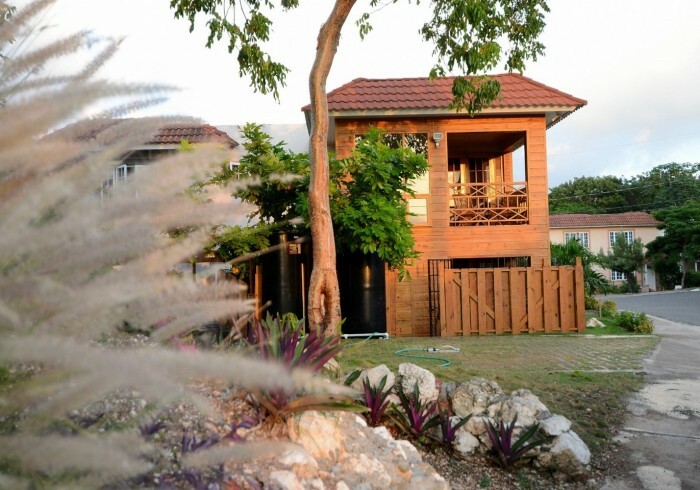 Ft. rustic styled luxurious Cabin in an elevated position directly overlooking the city of Kingston. The Neighborhood Our 3rd vacation rental property “Choose To Be Happy!” @ Long Mountain Cabin (LMC) which was newly constructed and is situated in Long Mountain Country Club. Long Mountain Country Club features outstanding rustic styled residences in an elevated position directly overlooking the National Stadium with spectacular views of the Palisados Peninsula, Port Royal and the Caribbean Sea. This is no doubt one of Kingston’s finest gated communities which boasts an incident-free record along with pristine grounds. “Choose To Be Happy!” @ Long Mountain Cabin (LMC) is located: - Within 6-8 minutes’ drive of The United States Embassy. - Within 10-12 minutes’ drive of: 1) New Kingston – Kingston's Corporate Business district 2) Bob Marley Museum – The world famous home of the legendary King of Reggae, a recent stop for US President Barrack Obama. 3) Shopping Malls 4) The Knutsford Express (Bus Station) 5) Emancipation Park 6) The Hope Zoo at the Royal Botanical Gardens 7) Nightclubs, restaurants, international business offices and 8) Embassies such as Canada and the United Kingdom. 9) The CRU Bar and Kitchen offers a fine mixture of elegance and relaxation. Their aim is to provide a wholesome and fulfilling experience, with top quality food, drink/cocktails and a staff that wants to exceed your expectations.